Revolutionary wash-in cleaning and reproofing treatment. 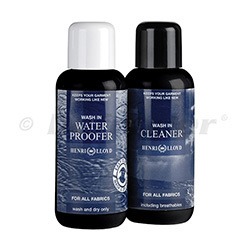 HL Cleaner is a powerful, waterbased, non detergent wash treatment, which is environmentally friendly. HL WaterProofer gives 100% water repellency.